Tired Of Being Locked Into An Endless IT Support Contract? Learn The Secrets To Saving Money On Your IT Services. Fill In The Form Below To Get Your Free Guide. For many years the Internet was known as the Information Highway. Fast-forward to 2016, and this still remains true. Businesses in the Green Bay area turn to the Internet to source information on almost everything. Can your website attract those looking for what you have to offer? Your website has many purposes; however, its main purpose is to convert visitors to future business opportunities while offering quality education on the products or services your business offers. Your website has the potential to be a highly effective marketing tool. Is your current website properly representing your business? Your website service doesn’t end once we go live. We continue to work with you and your company to ensure that your website continuously generates new leads. This includes future updates, content changes and even search engine optimization. Trust our team of website designers in Green Bay to provide your business with a great web presence. Call (920) 569-2681 or send us an e-mail to service@tcsdepere.com to learn more about how we can help your business. 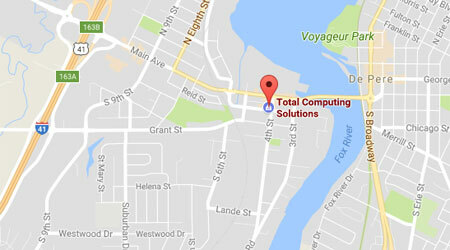 Stop into our office to discuss your IT needs. Computer problems? We can help!